I figured that it was time that I expounded on one of the patterns that I collect. French White. After all, it is this pattern/design that is ultimately responsible for this whole blog. Let me recap from the opening post of this blog. In 2006, I was making a casserole for a Potluck at work. Realizing that I did not have a baking dish that was big enough, I ran to the store and purchased a piece of, what I thought was, Corningware French White. When I got home and took it out of the box, it seemed awfully heavy. I began examining the piece and discovered that it had a firing on the bottom where it sat in the kiln. This was weird. So I dug out my quiche dish (purchased back in 1991 or so) and looked at the bottom... It was all nice and smooth, no ring. I checked my Souffle dish as well, it was smooth on the bottom too. So, I found "World Kitchen" on the Internet and started reading through their web site. This is the excerpt from their "History of Corningware"
The original CorningWare® bakeware which was first introduced in 1958, was made of a glass-ceramic material that could be used on the stove, in the oven and under the broiler. After World Kitchen acquired the brand in the late 1990’s, CorningWare products were switched to ceramic stoneware production. Introduced later that year was the French White collection, which has been an all-time best seller among brides-to-be. I knew this wasn't right. There was no possible way that French White was introduced in the late 90's, because I purchased my souffle and quiche dish in the early 90's and it most definitely wasn't made of stoneware. Something was amiss. I called World Kitchen and asked if there was any place I could buy original Pyroceram Corningware in French White. 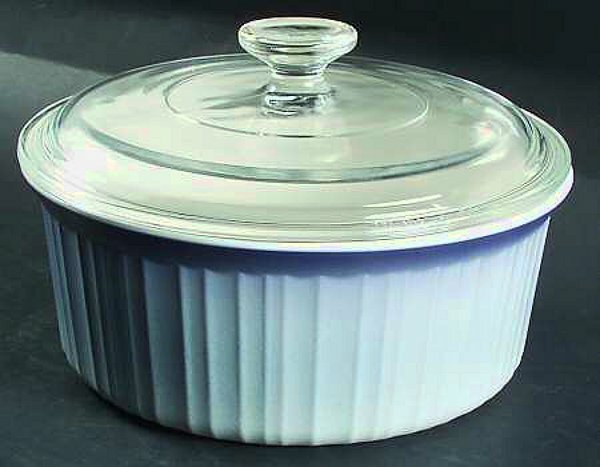 The Customer Service representative told me exactly what the web site said... French White was introduced AFTER World Kitchen purchased the Corning Consumer division in 1999 and it had always been made of stoneware and never from Pyroceram. When I informed them that I had Souffle and Quiche dishes in my kitchen that were made of Pyroceram from 1991, the representative called me a liar. TO MY FACE, or at least as "To your face" as you can get over the phone. They even had the sheer gall to argue with me after I gave them the "F-3-B" number off the bottom of the quiche dish. Then I suddenly got disconnected.. (I still think they just hung up on me) I was going to call them back and give then another "F" something, but decided against it. There ARE other ways after all. I am a very patient person, when I have to be. Now I will be the first to admit that I am not a big fan of change, but I understand that they changed the product because it was longer conducive to the way the majority of the population cooks in this day and age. I get it. What I do NOT like, is a corporation banking on a name that is associated with premium quality to sell an inferior product at a premium price. That piece of stoneware was an absolute joke. It crazed in less than a year. It wasn't from the automatic dishwasher either, cause the apartment I was living in at the time didn't have an automatic dishwasher. Just a manual one; Me. What I dislike even more than sneaky corporations, is when said sneaky corporation tells me I'M lying or crazy, when I am, in fact, quite correct and they are the ones lying through their teeth. But it's all water under the bridge now, kind of. As I posted earlier, REAL Corningware is back. Though they still aren't producing my beloved French White, I am happy that it is available to the public, even if only Online. Vengeance is mine World Kitchen!!!! Muah ha ha ha ha!!!!!! Your Customer Service department (and the falsified history on your web site) can Eat Crow!!!!!! Corningware didn't stop at just French White, though. It's true. Eventually they began printing patterns on the French White as well, as evident with English Meadow, Callaway, Oceanview, My Garden and Delicious (which I have never been able to find); just to name a few. But "patterns" were not the only way they altered French White over the years. These colors were both sprayed upon the entire outside surface of the French White pieces. The inside of these pieces was not painted. The most interesting thing about Classic Black, is that it really isn't black at all... It's dark red. Evidently, this has been a common practice with coloring glass. The pieces are either so deep a purple or intensely red that they appear black to the naked eye. Other examples would be Black Amethyst & Black Ruby Glass. I was married in 1981 and received a French White quiche dish (F 3 B), a large round covered casserole, an oval covered casserole, a shallow oval baking dish, and something else, I am sure. All for wedding presents in the summer of 1981. So yes, more proof of early French White. Thank you for all the great information on Corning Ware!